CAN A MYHR MORTAL SURVIVE SUCH PERIL? 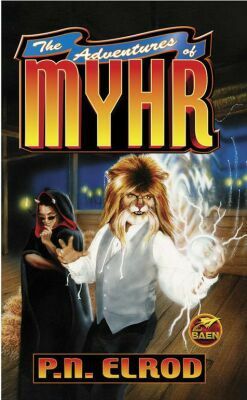 His name is Myhr--rhymes with purr!--he's half-man, half-cat, and all-adventure, traveling the multi-verse with Terrin, a twisted wizard who's into techno-raves and obscene T-shirt art. Displaced from Earth by a travel spell gone bad, they're heading home, bouncing from one bizarre planet after another. Their latest hasty escape has landed them on a world with a lethal magic problem. While Myhr sings Beatle tunes for their supper, Terrin tries to get them an Astral Plane road map--only there's a catch. All the magic has vanished from Rumpock City, along with nearly all the magicians, the catastrophe linked to an uncanny black fog that rolls through town each night. Trying to pick up clues, Myhr is picked up himself by the gorgeous lady Filima, a devious and not-so-very-bereaved widow in need of a fall-cat. It's up to Myhr to find where the magic went before Terrin's own powers are drained dry, leaving him worse than dead and the rest of the planet going to Hell in an express-mail handbasket.